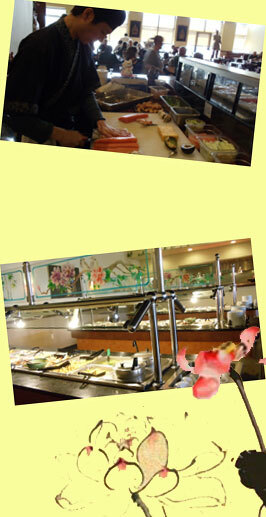 Shanghai Grill offers one of the largest and freshest Lunch Buffets in the area, with Sushi made on the side and a full Salad Bar with many choices of Dressing, Dessert and Ice Creams. We alternate items on our buffet every day, offering favorites like Sesame Chicken, Hibachi Shrimp, Roast Pork, Kung Pao Beef , Low Mein, Fried Rice, Walnut Shrimp… and more! We also have one buffet table for appetizers, where you will find Crab Rangoon, Egg Roll ,Buttermilk Biscuit, Tempura Vegetable ,Breaded Scallop ,Soups and more..
All lunches served with a side of Vegetable Low Mein, Fried Rice And 2 Pieces Of Crab Rangoon. Lunch menu is also available from 11 am to 3 pm. Please Note: Buffet Time is available from 11 am to 2 pm.